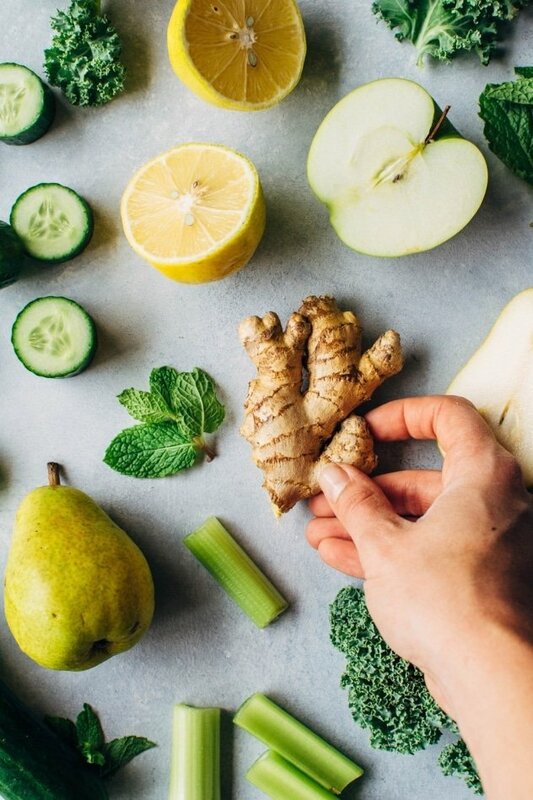 For YEARS I thought that since I didn’t own a juicer (hellllo only-so-much-cabinet-space in my kitchen), the only vibrant and healthy green juices I would be enjoying were the $7 one’s from fancy AF juice bars. Which, I admit, I do totally love. But unfortunately, my budget does not. 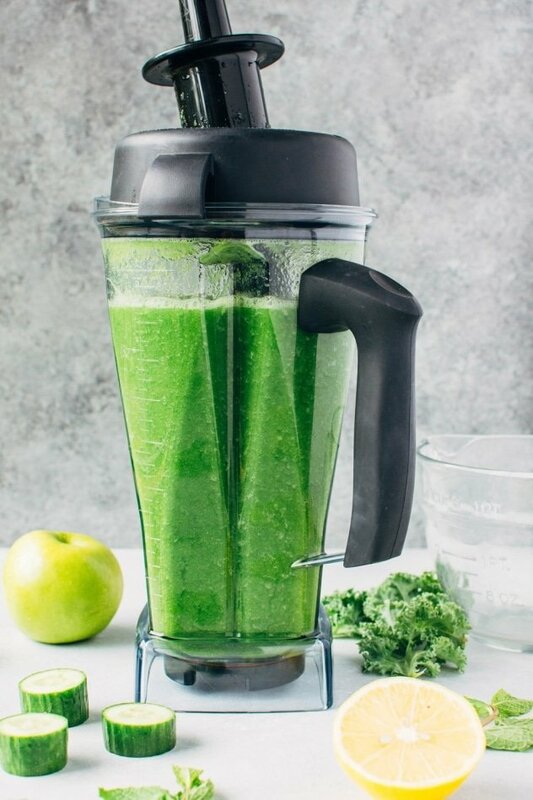 And so I finally got to thinking..
Can you make a delicious green juice without a juicer? And the answer, obviously, is YES! Otherwise this would be a pretty pointless post, right? And I ain’t here to waste your time, no way. Not with delicious green juice on the horizon. How do you do it? With a blender! And it’s actually really easy. And believe it or not, it ends up being just a biiiit more economical than a daily run to the juice bar. Okay maybe a lot more economical. I haven’t done the exact math, but based on a rough estimate: one batch of this recipe will run you about $7, which is about the same price juice bars charge for one juice 12-16 oz juice. This recipe makes about 3-4 times that and is just as delicious. 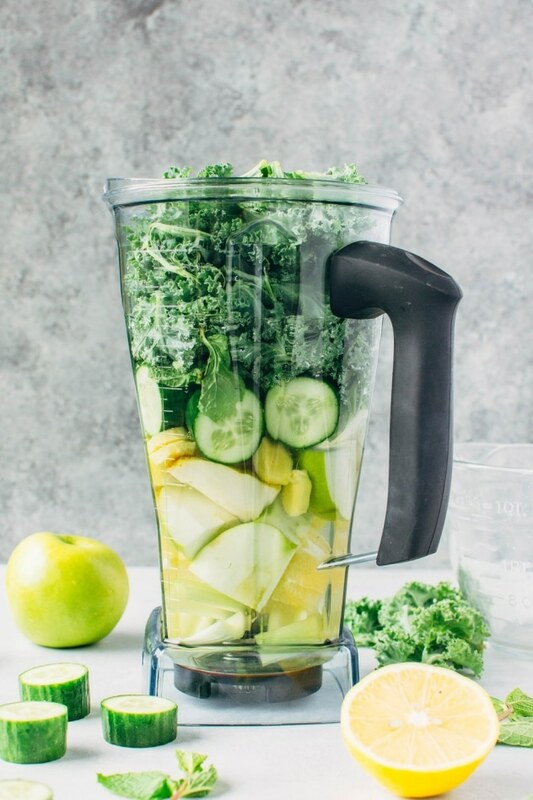 The basic formula for making this super easy and vibrant green juice is to add all of your chosen organic veggies and fruit to your blender (high speed obvi works best) along with water to make sure everything gets moving smoothly, and blend on high for several minutes – until no noticeable pieces remain. 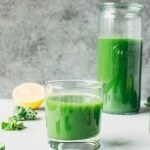 I generally go for a fairly vegetable forward green juice, to reduce the glycemic load (aka how much one of these makes your blood sugar spike!). 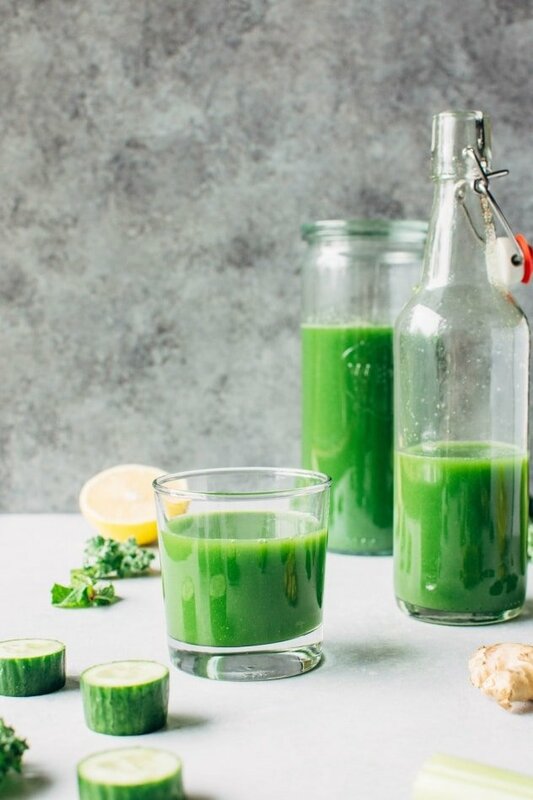 Which is why this recipe is not really a “sweet” green juice. It’s rather tart and quite “green” tasting . I would definitely encourage you to try it this way first! But if you want a more indulgent juice consider adding some pineapple wedges, or an additional pear. 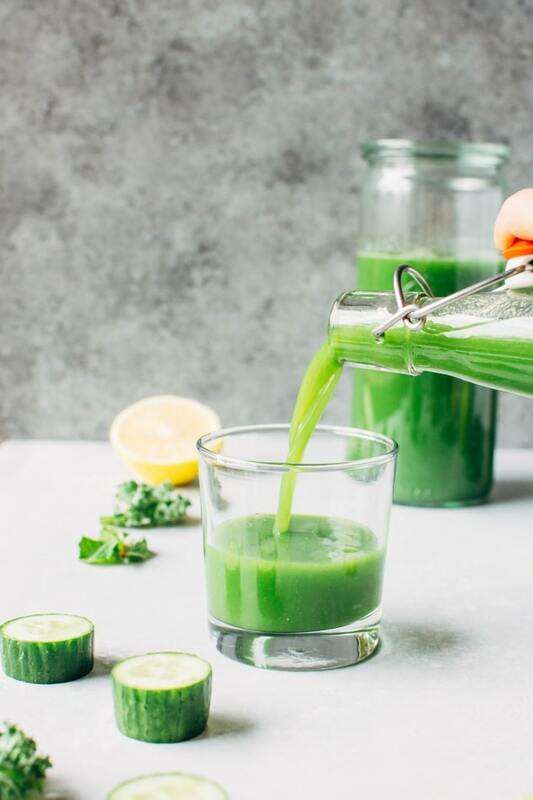 Here’s a little pro tip for you: Another way to reduce the glycemic impact of a green juice is to pair it with a little protein or healthy fat to keep those blood sugar levels stable. 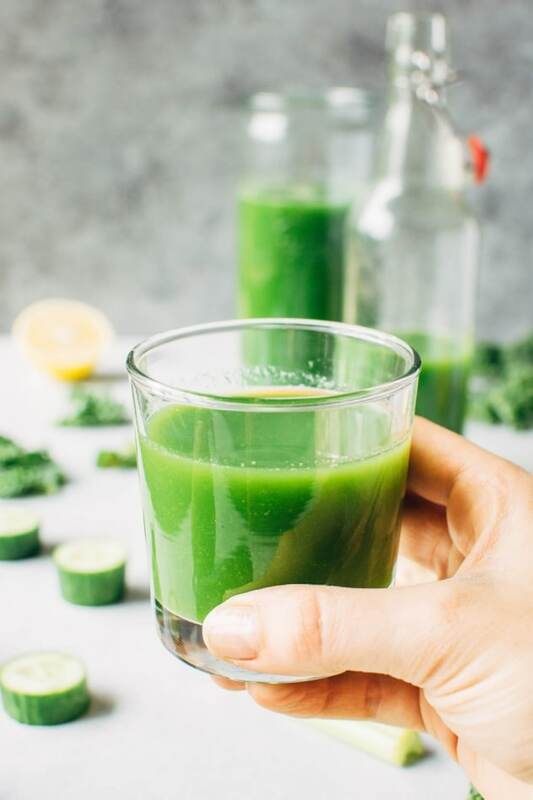 They can be a great accompaniment to a healthy meal, or a nice tonic to jumpstart your day alongside your fave bfast dish, but since they lack fat and protein, juice of any kind, even green probably isn’t a good idea to swap for a well balanced meal. After it’s blended to a beautiful + smooth consistency, you will strain the mixture through a fine mesh strainer into a large bowl. The juice will collect in the bowl, and the solids from your vegetable and fruit mixture will be left behind in the strainer! A rubber spatula makes this part of the recipe a bit easier to manage. I did this in several batches, emptying and rinsing out the strainer in between to keep the process smooth and easy. 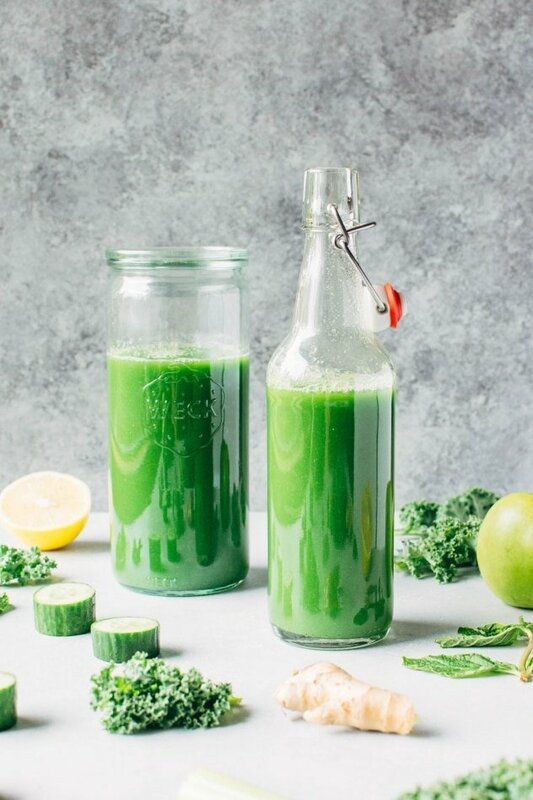 This lovely beverage keeps in the refrigerator for up to about 5 days, although there’s some thought out there that the nutrients are not as viable as time goes by, SO if you are making this just for yourself, you may want to make a half batch. 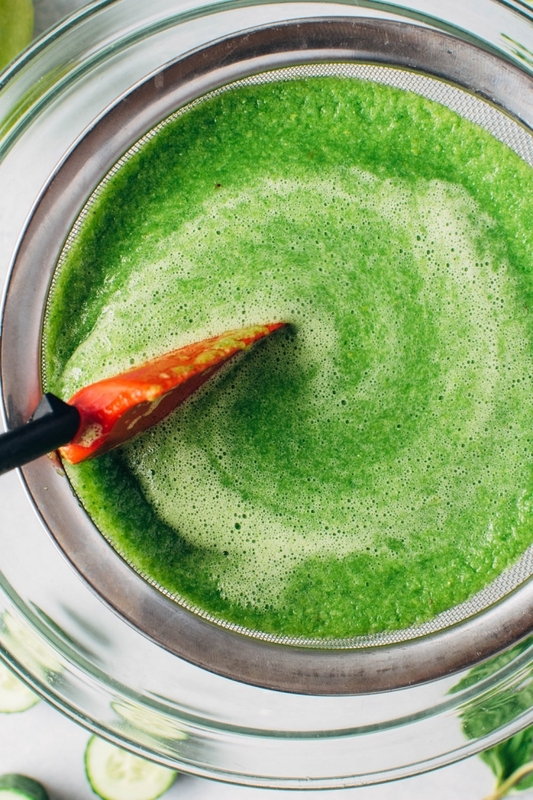 Delicious and vibrant green juice without a juicer is possible with this easy blender recipe! Add all ingredients to a blender. Apples, ginger, celery, pear on the bottom. Cucumber, mint and kale on the top. Blend on high for 1-2 minutes, using the tamper if necessary, until no large pieces remain. 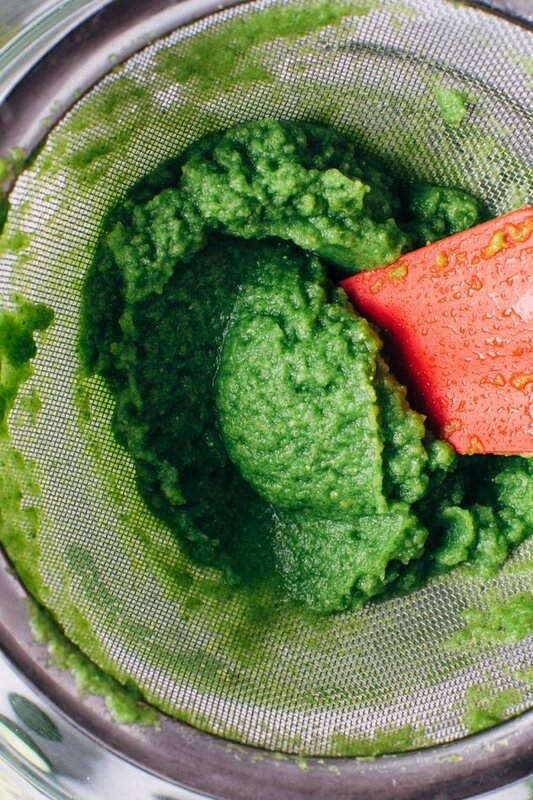 Set up fine mesh strainer over your large bowl and slowly stir pour the green juice into strainer until almost to the top. Stir with the rubber spatula, making contact with the strainer, and slowly press liquid out of the solids. Empty and rinse strainer in between batches of straining liquid from solids. Pour liquid into a sealable container and store in the refrigerator for 3-5 days. One blender full (the amount this recipe is for) makes about 7-8 small servings, about 6 oz each. If you’re just making this juice for yourself, you may want to cut the recipe in half so you can enjoy all the juice within a few days. But if you have folks to share it with, definitely make the whole thing! This entry was posted in drinks and tagged blender, breakfast, drink, easy, gluten free, grain free, green juice, healthy, kale, nyssa, nyssa's kitchen, paleo, quick, vegan, vegetable, vegetarian on October 3, 2017 by Nyssa Tanner.